FLOATERS An excerpt from the book Taking Care of Your Eyes, useful practical information about common and less-common eye diseases and disorders, and what you can expect – from examination through treatment, and afterward. “Floaters are translucent specks that seem to float about in your field of vision. Most people have some floaters normally, but they usually do not notice them until they become numerous or more prominent. Looking like cobwebs or squiggly lines or floating bugs, floaters become apparent when you look at something evenly bright, such as white paper or a blue sky, and are more evident when you move your eyes. They are especially noticeable on looking through an optical instrument, such as a microscope or binoculars. They are more common and seem to be more annoying to people who are nearsighted or who have had a cataract operation. Much of the interior of the human eyeball is filled with vitreous gel (also called the vitreous), a clear, thick substance that helps in maintaining the eye’s round shape. Light passes through the vitreous (after being focused by the cornea and lens) to reach the retina, where images are formed. Any bits of tissue in the vitreous cast shadows onto the retina, and you see those shadows as something “floating” in your field of vision. Before birth, there is a large blood vessel in the vitreous, but by birth the vessel is no longer required and it disintegrates — but not completely. The broken-up particles remain for life and float around. These are the floaters that everyone has. Other occurrences can add more floaters. As your eyes age, the vitreous may become stringy, and the strands cast tiny shadows on the retina. Bits of debris from other tissues in the eye may fall into the vitreous. Floaters may come from old or new bleeding within the eye. They may be the result of a disease that causes opaque deposits in the vitreous or of an ocular inflammation that causes cellular debris, or they may be a residual from an old injury. In most cases floaters are simply an annoyance. An eye examination will usually reveal if there’s something serious that needs medical attention. The sudden appearance of new floaters, sometimes accompanied by apparent flashes of light in the peripheral (side) vision, can be a sign that a vitreous detachment has occurred, a frequent consequence of aging that is not usually serious. On rare occasions, however, these symptoms can be a danger sign that a retinal tear has occurred. The only way to diagnose the actual cause of the problem is by a complete eye examination, followed by another one a few weeks later. Whenever floaters interfere with vision, you can shift them out of your line of sight by moving your eyes around quickly, side-to-side or up and down. The only way to get floaters out of the vitreous is by surgical removal, and since they are rarely more than a nuisance, the benefit of surgery would not warrant the risks. 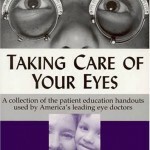 Excerpted from Taking Care of Your Eyes © 2003-2005 by Triad Communications.